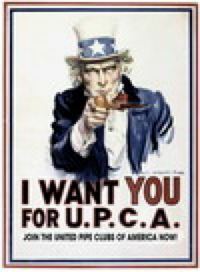 The results from the 2016 US national pipe smoking championship can now be found in the documents section of the UPCA webpage. The contest was held May 1, 2016 at the Chicago pipe show. Seventy-five people competed in the contest. The American and overall winner was Tom Dinelli from the Chicagoland Pipe Collectors Club. Manduela came in first place in the women's division. The St. Petersburg pipe club won the team competition.